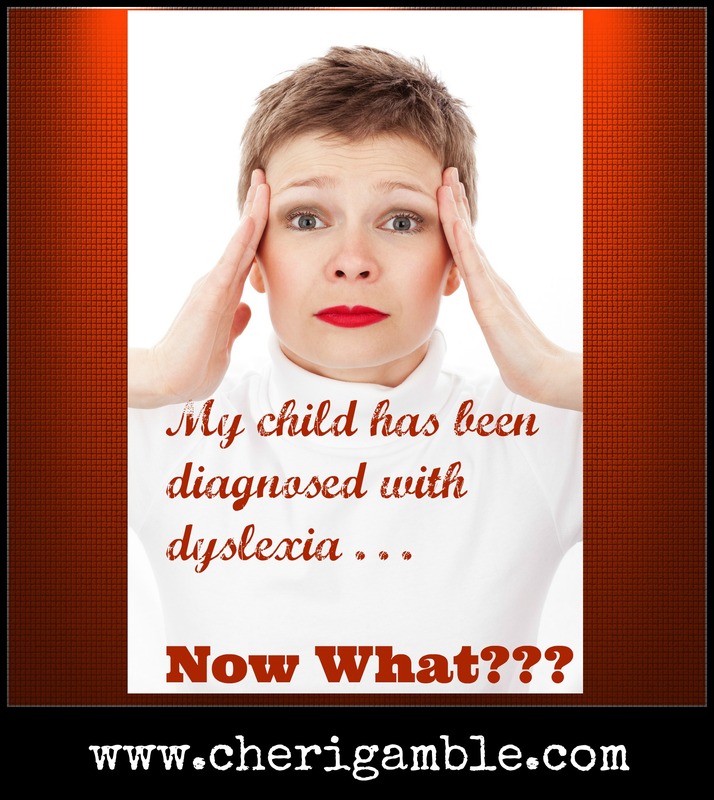 My Child Has Been Diagnosed With Dyslexia, Now What??? Do you have a child who has recently been diagnosed with dyslexia? Are you left wondering what to do next? Check out these suggestions from a mom who has been there! I am not an expert on dyslexia. I am not an educational psychologist, and I do not have all the latest knowledge in how to treat dyslexia. I am simply a mom of a child who was diagnosed with dyslexia less than a year ago. So, you could say, I am an expert on having a recently diagnosed child with dyslexia. As an expert on this subject, let me offer you ten ways to answer that question. 1. RELAX!!!!! Stop stressing out about the diagnosis. Your child has not received a death sentence! While dyslexia is not curable, it is cope-able. You and your child will learn how to cope – and you will continually be amazed at the resiliency and adaptability your child will demonstrate in his life. 2. Help your child recognize that he is not alone. In fact, he is in rather good company. It has been estimated that 1 out of every 5 people has dyslexia. This statistic includes such greats as Jay Leno, Henry Winkler, Alexander Graham Bell, and Thomas Edison. Check out this site for more famous people with dyslexia! 3. Teach your child all about dyslexia. Often as parents we don’t want to label our kids. We don’t want them to feel different, so we tread softly on any subject that might include a label. However, it is very important for children with dyslexia to understand exactly what they have. Instead of making them feel worse, knowing all about dyslexia will actually empower them and give them the understanding they need to become their own very best advocates. The first thing we did when our son received his diagnosis was help him find out all he could about what that meant. We took him to this site and discovered together. 4. Teach your child to share his story. As I mentioned before, our children need to learn how to become their own very best advocates. One of the ways to do this is to help our children know how to tell others that they have dyslexia. Earlier this summer, I sat down with my child and helped him tell his story of dyslexia. I then shared it on my blog. What an incredibly rewarding experience it was for my son! He learned that his story could make a difference in someone else’s life! At the same time, he helped other children learn that they were not alone. It was a win-win situation. 5. Find a support system. Find some friends and family members who care about you and your child and who will serve as a support for you as you adjust. If you can’t find anyone near you, find a virtual group like this one or this one. 6. Join Bookshare or Learning Ally. Both of these sites are great resources for you and your child. They both offer almost any audio book imaginable to its members. Bookshare is free to any student in the United States with an official diagnosis of dyslexia, while Learning Ally has a fee. 7. Find and encourage your child’s strengths. If you have not learned this yet, soon you will learn that all kids with dyslexia have incredible areas of strength. For my son, it is art, sports, and social ability. We currently have him enrolled in an art class and on a soccer team. 8. Take a break. Do not feel that you have to jump right in right away. Your child has been struggling for awhile now, let him have a break from all the hard work associated with reading. When we began the process of testing for dyslexia, I stopped all reading classes all together. Then, when I started back up with reading, I did it a whole new way. Kids with dyslexia learn differently . . . they will need to be taught differently, too. We are currently using All About Reading with our son. Another great, but much more expensive, program is the Susan Barton program. 9. Find help if needed, but recognize that not all help is equal. As I mentioned above, kids with dyslexia learn differently. A typical public school special education class will do nothing but cause frustration for your child. If your child is receiving special services at school, make sure that the person working with him is experienced in working with dyslexia. Do not assume that just because a person has a degree in education, he is qualified to work with your child. KIDS WITH DYSLEXIA LEARN DIFFERENTLY!!! Find someone who understands that to work with your child. 10. RELAX!!!!! Stop stressing out about the diagnosis. Your child has not received a death sentence! While dyslexia is not curable, it is cope-able. You and your child will learn how to cope – and you will continually be amazed at the resiliency and adaptability your child will demonstrate in his life. I hope this article has encouraged you and helped you to see that you CAN deal with your child’s dyslexia AND help him thrive! I would love to be able to encourage you more, and that might happen if you like my facebook page. Also, if you are interested in our dyslexia story, you can find it here. Great thoughts! My oldest was diagnosed with some nonspecific learning disabilities awhile ago, but it is looking like it might be dyslexia. I really appreciate your resources and ideas! The hardest part, I think, is teaching him that he isn’t alone and this isn’t the end of the world! I’ll have to tell him that he’s in good company especially since he thinks Edison was really cool! Thanks for linking up! He’s in great company!! I hope things are going well with him and that he has realized he is not alone! Thanks for commenting.